All the materials and resources from our #ICEOutOfNORCOR campaign are here for you to use and share!! 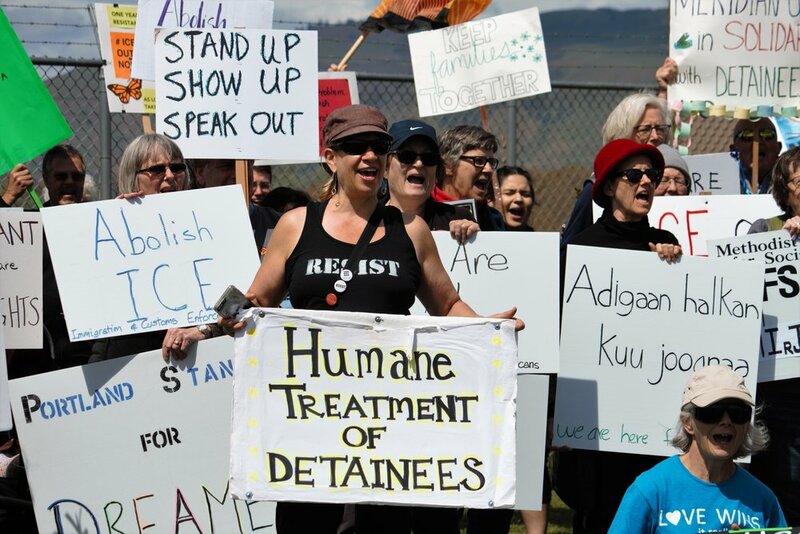 On May 1st, 2017 a hunger strike was launched by immigrants who had been detained at NORCOR, a four-county public jail in The Dalles that has a contract with Immigration and Customs Enforcement (ICE). 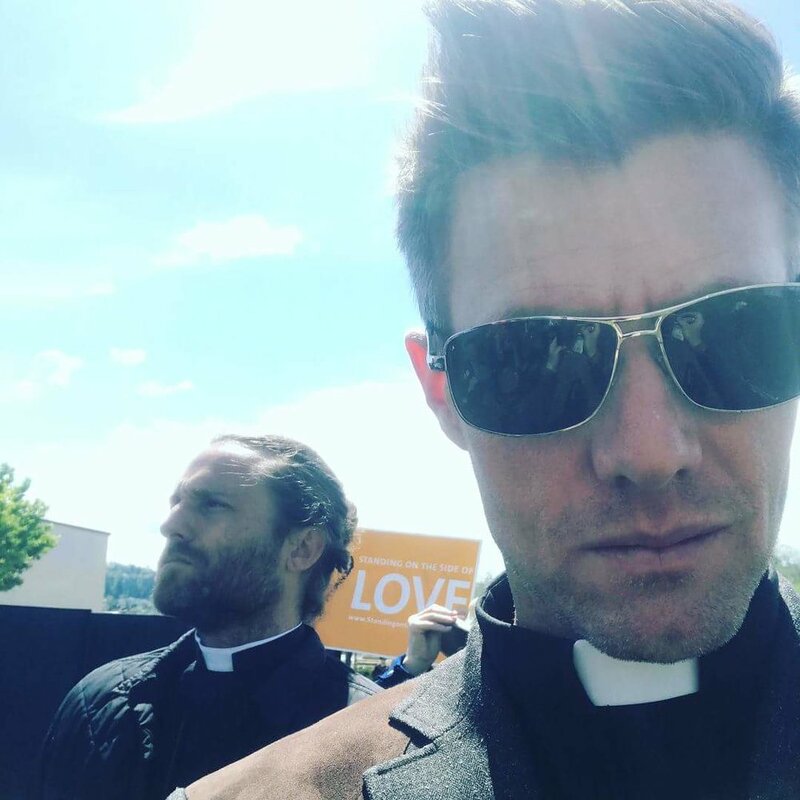 That same week, local organizers began to host daily vigils outside NORCOR and clergy began to visit people detained inside the facility. Faith communities from around Oregon traveled to stand in solidarity with those detained. We heard countless stories of poor conditions, the outrageous cost of phone calls, the profound effect a “No Visitation” policy is having on families and the morale of those detained, and why NORCOR's contract with ICE is in violation of our state’s 30+ year-old sanctuary law. came together and took action. Weekly videoconference calls regularly brought together over 30 leaders from faith communities around the state for story-telling, strategizing, political education and prayer. 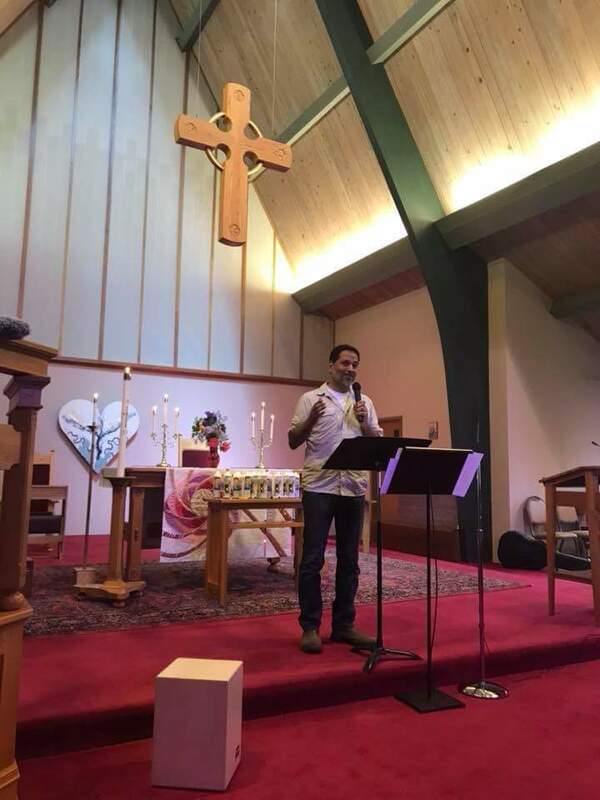 Locally, congregations shared the stories of detainees from pulpits and bimahs. 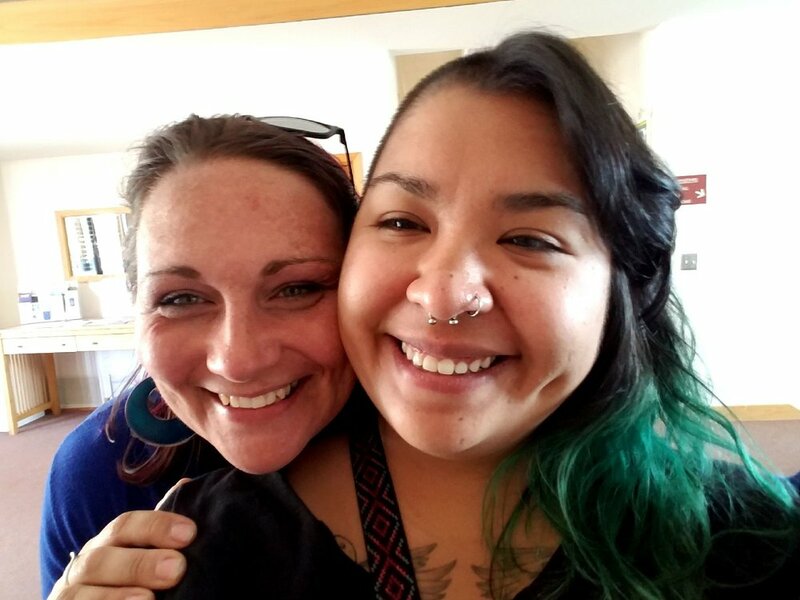 They created altars, organized educational forums, lit candles, read litanies, painted banners, hosted sign-making parties with youth groups, and mobilized local actions to educate and engage their communities. And they took action: signing petitions, writing Letter to the Editor of their local papers, and raising money to support. with over 300 people from across the state. 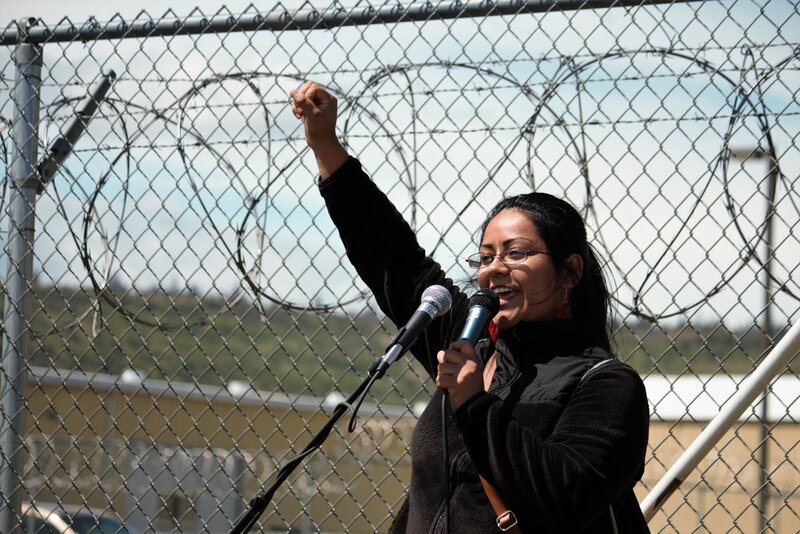 Here we share a series of stories from immigrants who have been detained at NORCOR. The stories have been written by either clergy or attorneys - the only people who are currently allowed to visit immigrants detained at NORCOR. Names and minor details have been changed to protect individuals’ privacy. We have never seen David so low in spirit. He reports that he enjoys his kitchen job and being able to watch the extra television. He says he likes his classes. He especially likes the parenting classes. But as we talked more, he admitted that he is really pretty depressed about his family situation. He has lived in the US since he was a little boy. And the uncertainty of when he will be released or deported is depressing. On the outside, he was an auto mechanic. He’s really bright, clearly a hard worker and has ambitions and dreams. He misses his five-year-old and his whole family. He reports being too depressed by NORCOR to even talk to them on the phone. David does not expect to be released. He expects to be deported back to Mexico. He will join the military if he gets deported because he doesn’t want to live in the town where he has family. The drug cartels run the town, and his uncle was killed by the cartels. The family has tried to bring the case to the police but the police are corrupt down there. 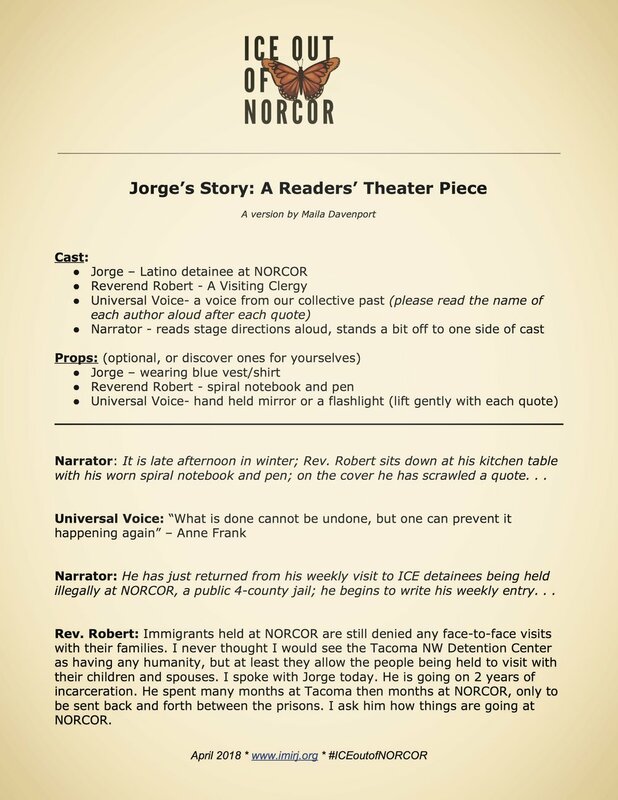 "Jorge’s" story is a composite of multiple stories that shares the truth of the experiences of those detained and protects their identities. When I asked Jorge how things were going inside NORCOR, he said, “They took my pillow.” “They took your pillow?” “Yes,” he said. “They replaced my old mattress with a new mattress with a built-in pillow. Then they took my pillow. 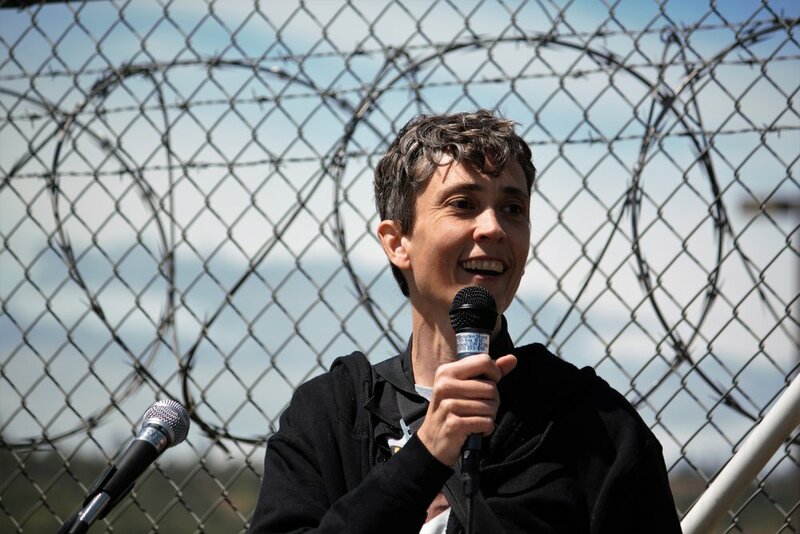 It is uncomfortable and I am not sleeping well.” I felt frustration rising in me at the subtle dehumanization that Jorge and other detainees face every day. He said he had a dream a couple night ago. 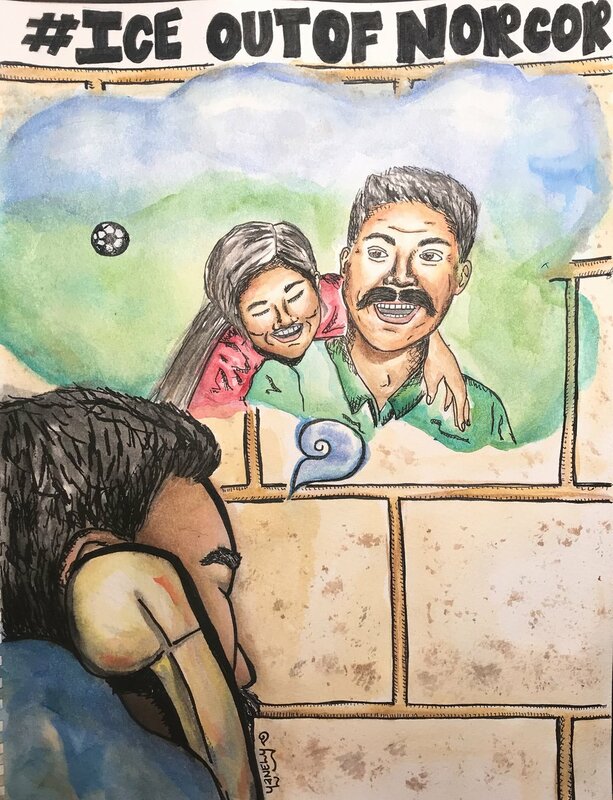 He said, “God gave me this dream.” In the dream, he and his children were playing soccer out in their yard and he and his daughter Laura got tripped up, and both fell down. Looking at each other, they started laughing and laughing together. He said he woke up laughing with a feeling of peace. He was at peace with his daughter. He decided that day he would call her. He called her and told her about how he was feeling— how he felt ill at ease about their argument and he told her about his dream. They cried together over the phone. And now Jorge has me tearing up with him as he tells me this beautiful story. Jorge said if it is possible, could he have some more money for his phone account because he is running low after the long conversation he had with his daughter. 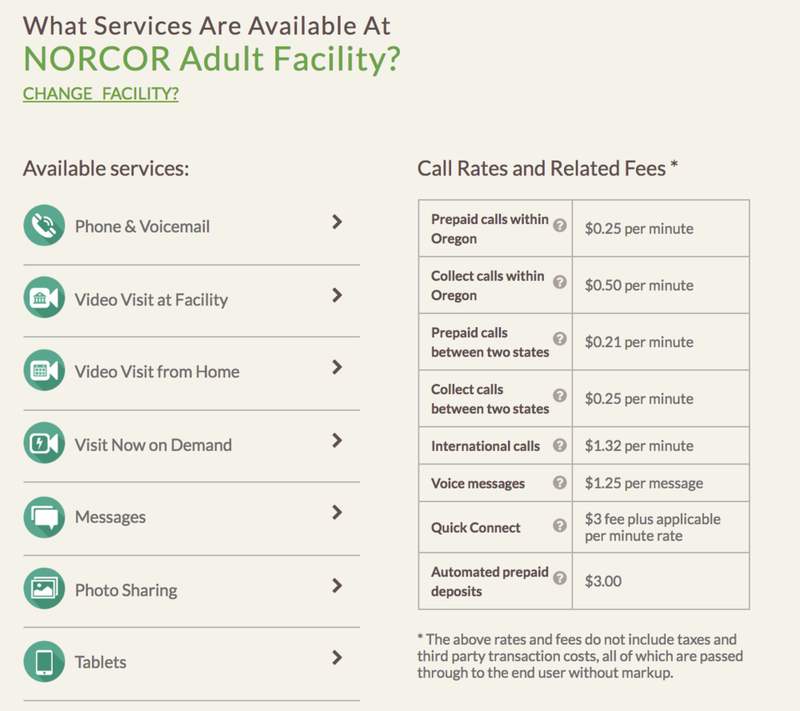 Phone calls are expensive at NORCOR, 25 cents a minute, three times the amount of a phone call at Tacoma. I told him the visiting clergy are coming up with a way to pool donated money so we can put money on individual phone accounts at NORCOR easily. He was very happy when I told him that people of faith from around the state were interested in supporting him and his family. "Veronica’s" story is a composite of multiple stories that shares the truth of the experiences of those detained and protects their identities. Veronica greeted us with a shy smile and bright eyes. Though she was trying her best to be cheerful, sadness surrounded her like a grey cloud. She’d had another night of poor sleep, waking as she often did to dreams about her children. Veronica has been away from her husband and her two children, all U.S. citizens, for over two years now. One of her children is in the second grade; the other is a toddler. The youngest one doesn’t understand why her mother isn’t living at home. Veronica tells us that when she makes a video call from NORCOR her youngest says, “That’s Mama’s house.” I felt sadness welling up inside me. This small child cannot visit her mother while she is detained at NORCOR. Immigrant detainees at other facilities are allowed family visits. Immigrant detainees at NORCOR are not. Veronica wants nothing more than to be reunited with her children. Though the summer heat blazed outside, Veronica told me she is often cold. She wraps a blanket around herself for warmth and protection from the intense air conditioning inside. She doesn’t have a sweatshirt like she did at the facility she was at before she came to NORCOR. Detainees must wear short-sleeved smocks and light pants. No sweatshirts are available. When Veronica was transferred to NORCOR, she wasn’t allowed to take any personal belongings with her. She asked us if we could get her some colored paper to make origami animals to mail to her children. Unfortunately, current policy at NORCOR won’t allow for the simple gift of paper to a detainee. Veronica does not have any legal representation. Her family cannot afford to retain an attorney. She doesn’t have much hope for her case. She fears that her children will grow up without her if she is deported. She used to send money to her mother in Guatemala before she was taken into ICE custody. Veronica worries about her. Veronica’s face beamed when we showed her photographs of people standing in daily vigil outside NORCOR. She knows she and the other detainees are not forgotten. "Oscar's" story is a composite of multiple stories that shares the truth of the experiences of those detained and protects their identities. Oscar greets me with a warm smile and asks me how I am doing. 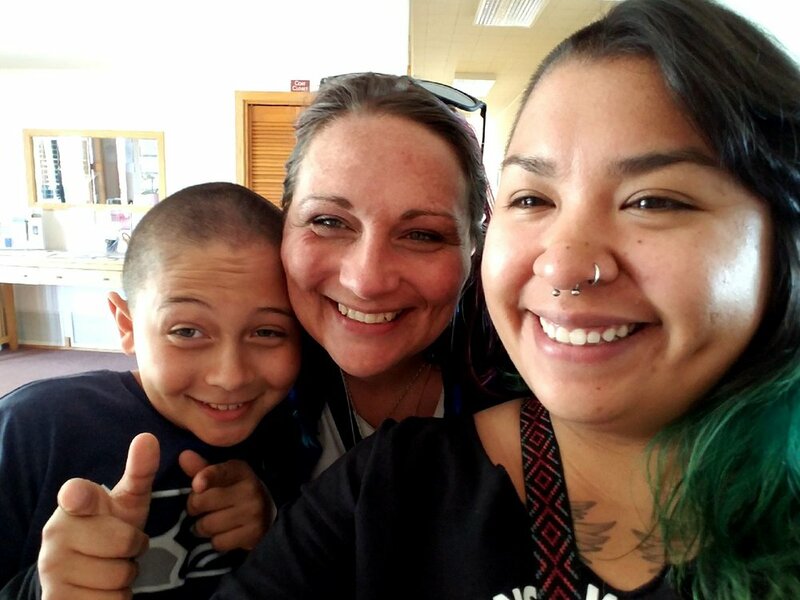 He has been at NORCOR for only a week, but has been sent between the Northwest Detention Center (NWDC) in Tacoma and NORCOR several times before this. In total, he has been in detention for almost two years. I ask him if he has been in touch with his family, and he swiftly looks more tired and winces. He has two children, both middle school age. His daughter loves violin, and has been playing at a very high level for her age for several years now. Last week, she left her violin at her bus stop and lost it, and of course is devastated. It is very painful for him to not be able to comfort her in this upsetting time for her. Oscar is fighting so hard to stay in this country because, even if his birth country of Honduras was a place he felt safe bringing his children to—which it is not—he cannot remove them from the country without the permission of their mother. He has not been in touch with their mother for several years. He reports that she struggles with addiction and mental illness, and as far as he knows, is living somewhere in Seattle on the streets. He reports that the woman who used to babysit his kids is now their primary guardian—they do not have other family locally. Oscar has lived in the United States since he was eight years old, and this is home for him and his family. Oscar finds comfort in reading the Bible, and in drawing. This helps calm his mind and gives him hope while in captivity. He reports that the last time he came into NORCOR, his drawing pencils were seized along with most of his personal possessions he purchased from the commissary at NWDC. I asked why that happened, when I have seen other people who are detained with numerous personal items. He tells me that sometimes NORCOR lets them keep their items; sometimes they take everything, even their clothes— it seems arbitrary and feels punitive. A major challenge he reports with being in NORCOR is the lack of resources for people in the middle of immigration cases. NWDC has an immigration law library; NORCOR only has a library with resources for criminal law. It is a very difficult place for people to stay in long-term, especially those who need good access to resources to prepare their case or affordably call their lawyers. He noted that even the handbook for NORCOR and NWDC illustrate the difference in perspective for people who are being held in detention: at NWDC, they are called “guests”. At NORCOR, they are called “criminals”. He reports that there have been instances where people are taken from NWDC and put in a bus without being told why they are leaving or where they are going. It is only when they see the sign for “The Dalles” and they realize where they are going that some begin crying, dreading the return to NORCOR. Still, he wanted to emphasize that the staff at NORCOR are, for the most part, very respectful. To him, they seem like kind and relatable people just trying to do their jobs. He says that it is the protocol that the staff has to enforce, not the staff themselves, which makes NORCOR a difficult place to be. 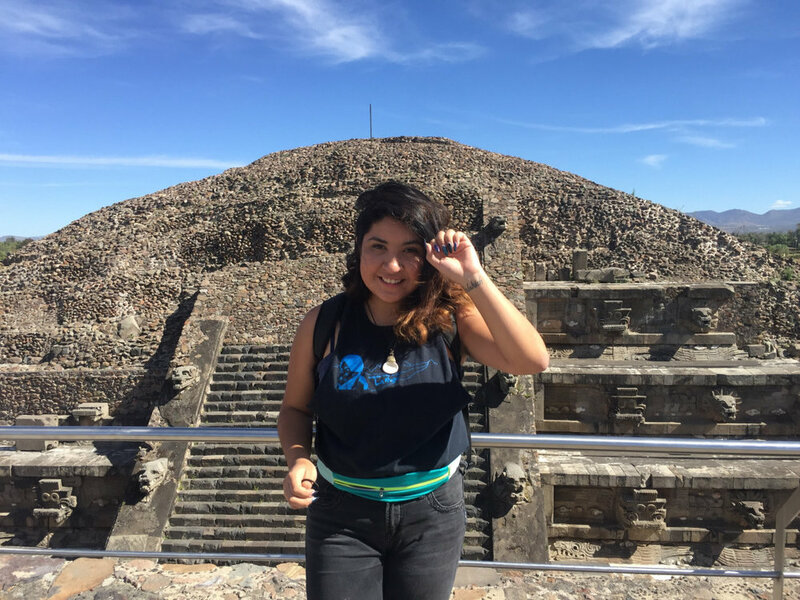 About the Artist: Yanely Rivas is a visionary, an artivist, and a community organizer. She's also a Xicana, daughter to migrant parents from Mexico. Currently she works with Unite Oregon as Lead Organizer for Washington County and is a member of IMIrJ's Washington County Leadership Team. Learn more about Yanely and her art here! 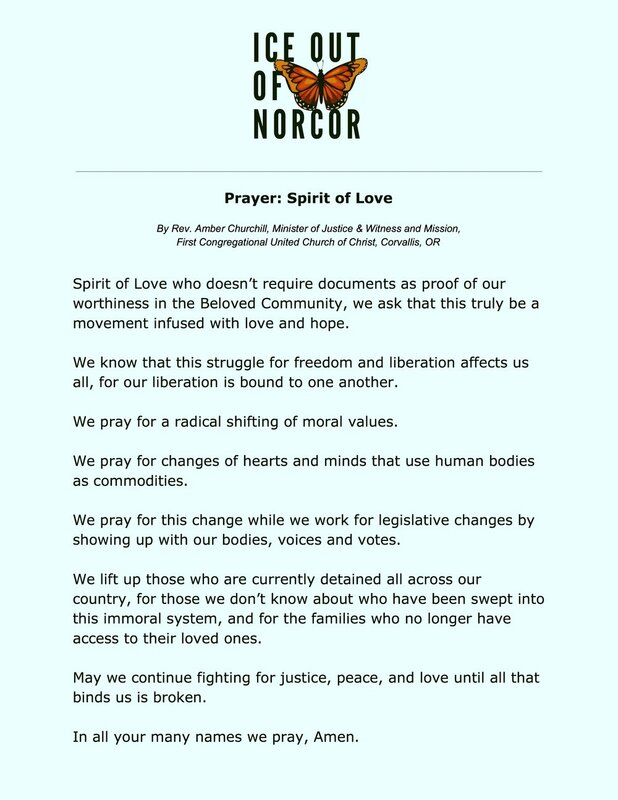 Throughout the month of April, IMIrJ will be sharing a series of actions that you and your faith communities can take in support of the demands of immigrants who have been detained at NORCOR and the local clergy and organizers who have been supporting them over the past year. Sign this letter urging the NORCOR board to reinstate family visitation for immigrants detained at NORCOR. Then encourage others to sign as well! Can you set a goal of signatures for your faith community? We’ll deliver the letter to the NORCOR board at their April 26th board meeting. Week #2: Amplify the Stories! Copy an image and an excerpt from one of the stories of immigrants detained at NORCOR above. Share it on social media! Make sure to tag #ICEOutOfNORCOR and #IMIrJ. Let's make sure that our communities hear these immigrants' stories. Let your community know why what's happening at NORCOR matters to you and faith communities across the state! Draw from this template and these talking points to write a letter to the editor of your local newspaper. Check out these helpful tips and e-mail info@imirj.org if you need further support! Immigrants detained at NORCOR must pay 25 cents/minute to make phone calls. Let's make sure they can communicate with their family members and attorneys! Make a personal donation and take up a collection in your faith community. Collection and disbursement managed by local clergy through Gorge Ecumenical Ministries. We need Oregon Attorney General Ellen Rosenblum to defend Sanctuary and challenge NORCOR's contract with ICE. Print out these postcards and ask your fellow community members to personalize, sign and send. Provide postage to make it easy as 1, 2, 3! 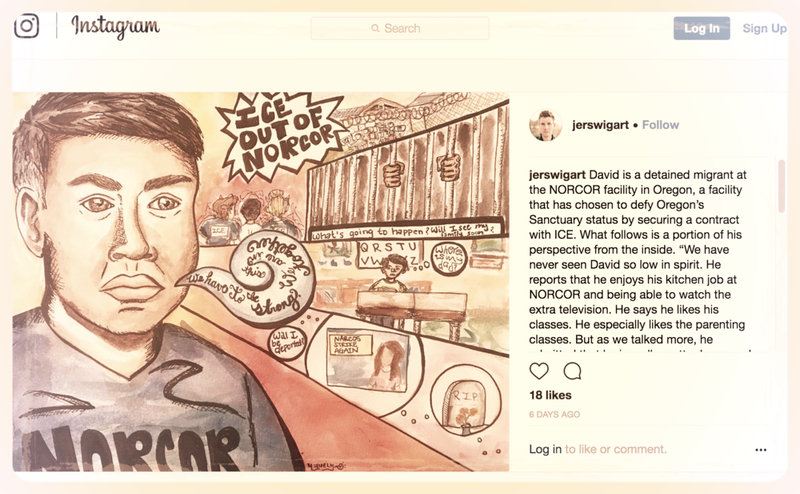 A brief history of the NORCOR jail's history with ICE - and the resistance movement pressuring NORCOR to divest from the inhumane and unjust immigration/detention/deportation system. Visit Gorge Ice Resistance to learn more about the inspiring organizing of local leaders in The Gorge! 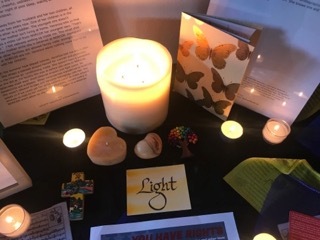 Prayer: "We Are Together on the Journey"
To commemorate the one-year anniversary of the first hunger strike by immigrants held in detention at NORCOR, people of faith from across the state came together and took action. 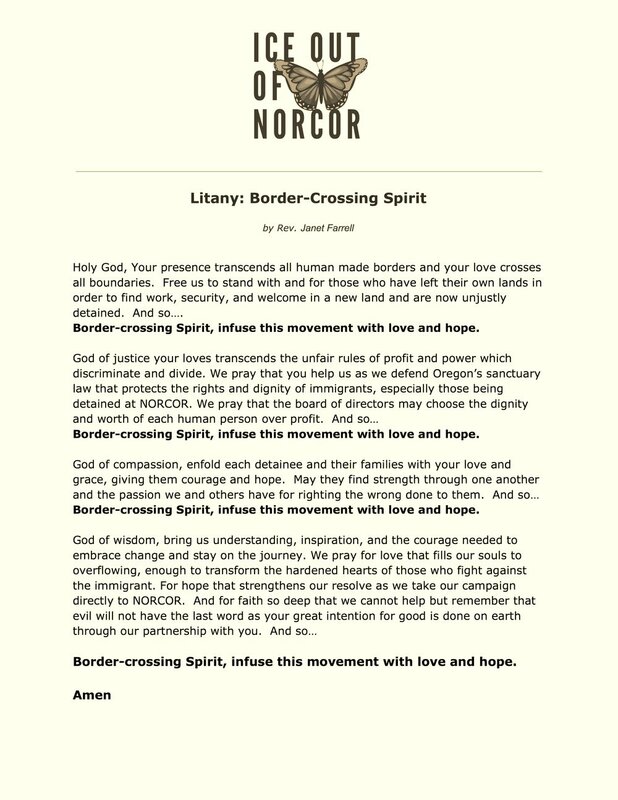 On Saturday, April 28th over 260 people of faith from communities across the state convened in The Dalles, Oregon to mark the one-year anniversary of immigrants' first hunger strike protesting conditions at NORCOR. 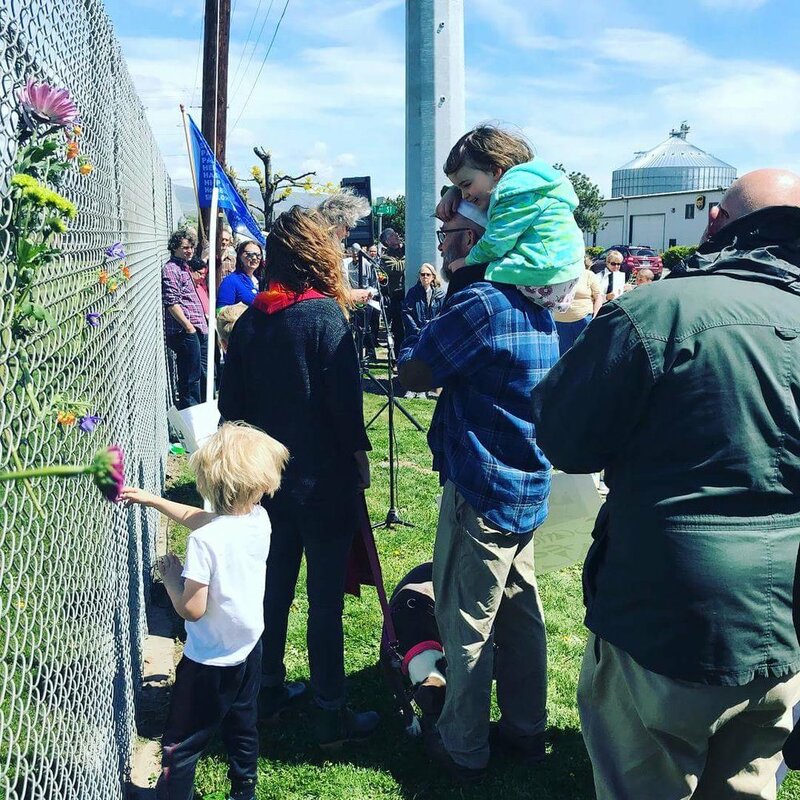 We joined with local organizers and clergy to stand in solidarity with immigrants being detained in the four-county public jail in The Dalles. We sang, we raised fists, we cried, we laughed, we built relationships, we listened, we walked silently, and we chanted-- demanding ICE get out of NORCOR. From Meeting to Mass to Mosque, Sangha to Synagogue to Sanctuary, people of faith and people of conscience are stitching together a powerful Interfaith Movement for Immigrant Justice throughout Oregon! Make a Banner to Bring or Send! This project can build interest and engagement for all ages. 1. Print butterfly design (download here!) on paper or card stock; cut out. 2. 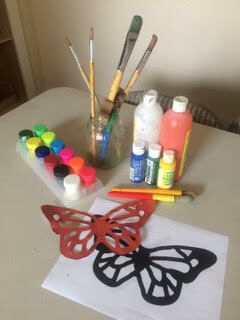 Use black fabric and butterfly stencils; paint designs with sponges or paintbrushes. 3. For large flags, message can be projected onto the fabric using pencil or chalk for letters and again, stencils, sponges and paintbrushes for butterflies. 4. Consider adding a message, such as "Ashland Unites for Justice for Immigrants" or "Lutherans say #ICEOutOfNORCOR" or "Ainsworth UCC says Keep Families Together"